Four years ago, the first storyteller went on a trip to South Africa. On route the plane landed in an unnamed country, one of which I've forgotten. The storyteller was on transit in a city which is known for its bleak and desolate past and present. He could of course not leave the airport because it was a transit flight. So when the flight departed, the one memory he has of the city was the orange skyline that was coloured by the departing sun. After a few more exchanges, the first storyteller left and joined his companion as they circled me. A few years ago, the second storyteller was camping in Doha with her friend. She talked about walking the sand dunes and ridges of the great Safari desert. The conversation steered towards dreams and we talked about human souls, dreams as an escape of reality, human's impact on earth and how the earth doesn't even feel us and finally human's desire to conquer the space time continium to time travel. We talked about London and the Thames and how just 5000 years ago there were no traces of humans. If we humans would disappear, it would only take a thousand years for nature to wipe all evidence of us. A blink of an eye in earth's history before she abruptly left. These are two examples of the intimate stories that were exchanged between me and two storytellers in Tino Sehgal's These Associations. The installation or participatory exhibition as I wold have called it, was surreal, imaginative, eerie and scary at the same time. 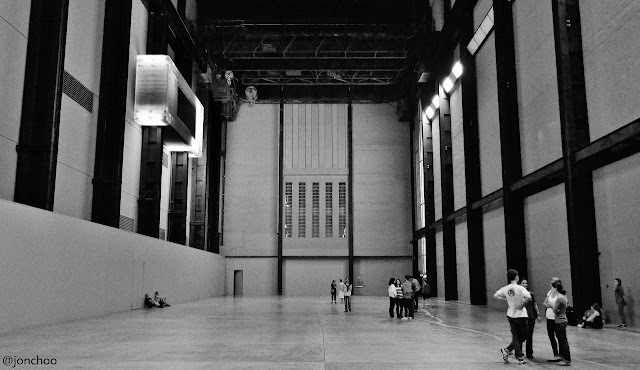 Rarely has any of the past passive exhibitions at the Turbine Hall gave me any sort of emotions, let alone four. It may be an example of 'pretentious art' and the stories may be true or otherwise, but it was no less compelling. Tino Sehgal's These Associations is part of The Unilever Series at Turbine Hall, Tate Modern and will last until 28 October 2012. It is the first live exhibition in the series.